WASHINGTON — Roughly a year ago, the Pentagon stood up the chief management officer role — a congressionally mandated job that ranks third in the department hierarchy — to find billions of dollars in efficiencies. Less than nine months later, the first CMO, Jay Gibson, was pushed out of the department amid rumors of ineffectiveness. 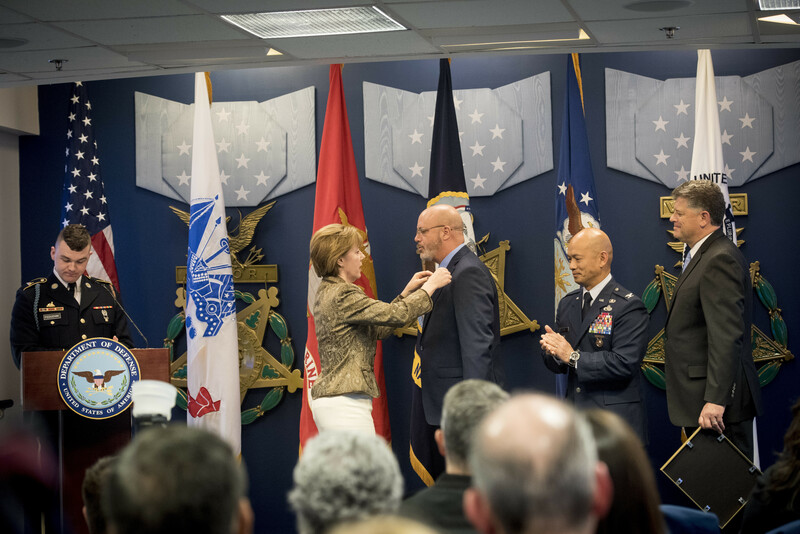 Taking up that role is Lisa Hershman, now the acting chief management officer for the Defense Department. Hershman will have the lead in guiding the department through the fiscal 2020 budget cycle and finding extra money to put back toward war fighting. Her office has already seen some success: The Pentagon’s hunt for efficiencies found nearly $5 billion in savings by the end of fiscal 2018 — the result of 114 potential projects identified by the CMO’s office. In a Feb. 5 interview with Defense News, Hershman laid out her goals for the next year and what lessons have been learned from her time spent thus far in the CMO office. The CMO office was charged with finding $46 billion in savings over five years. You previously said you found $4.4 billion for combined FY17 and FY18. Now that the validation work is done, where did you end up? Our validated number is $4.7 billion [in efficiencies]. We have savings from the working capital funds, but we don’t have a finalized process. We’re working on a process to be able to validate that because it’s a little bit different. There is a little bit more, not a whole lot. We’re partnering with the comptroller on putting that in place because as we look across the fourth estate, we’re going to run into more instances of working capital funds, and we want to make sure we give people credit [for finding savings]. For FY19, what are you targeting to find greater savings? Five key initiatives: category management, buying goods and services differently, IT and business systems, logistics and supply chain acquisition, and healthcare management. Those are our big ones. Now, what we’re looking at is not only how we do things, but we’re looking at those processes, we’re looking at policies, systems and then resource alignment. And the reason I say “policies” is I have a team within CMO that reviewed 716 regulations, so it’s oversight and compliance, and they made recommendations with a cross-functional team to repeal 249 [of those regulations]. And that saves the taxpayers [an estimated] $25 million. Category management seems about as wonky as things can be, but you’ve talked before about why it’s vital. Do you have an example of how it works? I use the example of two-by-fours. We had 18 contracts for two-by-fours, many with the same supplier, [and we] got it down to two. So, how do you do that? First of all, is there a centralized way in which we can view what’s being purchased? That’s step one, but step two is about how I name you the two-by-four category owner, and now you buy all two-by-fours for everyone. By the way, this is common in industry, McDonald’s does it with a variety of other industries. And you have the authority as CMO to just say, “Tag, you’re it” for that new leader? Or do you need to get all stakeholders to OK the move? I don’t have to, but you can sustain change a lot longer and in a more lasting way if you engage with people and have stakeholder engagement. The other reason that’s important is you learn from every one of them. So, I like to sit down and talk to folks who were impacted because every time I do, I learn something new that helps us make better decisions. So while I have the authority to override, or go over people, I haven’t necessarily had the need to do that. What I have found in a surprising, very positive way is people are anxious to make change. If they’re navigating broken processes, they’re more than excited to have a voice in making that change. And they’re the ones that will say: “I’ll tell you exactly what it needs to be changed.” And I want them on the team. I want somebody who’s living it on the team to help change it, and that’s when you sustain it. What lessons have the first year of the CMO’s office taught you? While the dollars are very important, we want to make sure that we’re not overlooking other important metrics, or even sacrificing one metric for another. So for instance, while we want to make sure that we are prudent with cost savings, we also don’t want to hamper customer experience. That’s everything from serving our soldiers to making sure we’re supporting the mission, but it’s also from the other side when we talk about our industrial supply base and our suppliers and our contractors. Can we have improved processes, more streamlined processes? Is there a way that we can make engaging with DoD a little bit easier? One of the two big changes for FY19 for reform involves creating more of a balanced scorecard. It still includes cost, but we’re also looking at things like cycle times, reducing duplication, actually being able to do things earlier on, quality levels, customer experience levels. That’s for internal customers as well. It’s maybe kind of a boring example, but we hear about the time to hire [being too long], and what we found out is we gauge that by when somebody is in the chair, ready to work. But for Washington Headquarter Services, our internal customer may say, “Actually it’s the holidays. Why don’t we wait till after the new year,” and suddenly you’ve got 60 days [as the listed time]. And so we want to make sure we have the right metrics to really give us a true indicator of our performance. Are there going be any markers in the budget regarding reform that we should look for? So for the first time in the department’s history there will be a formal reform budget within the budget book. And we currently have more than 50 reform initiatives that will be reflected. What we’re actually really excited about is those represent [the Office of the Secretary of Defense], fourth estate and the military departments. So we promised that we were trying for cultural change, and we’re seeing enterprisewide engagement on this. Those are some of the things you’ll see in the budget that have never been seen before that directly speak to reform. We’re actually giving a nod specifically to numbers allocated for reform. Let’s keep in mind, some of these, to make these big changes might include some investment, but there’ll also be savings. So you’ll see that directly tied to reform initiatives. Standing up a new office can have unintended consequences. Have you found any gaps or overlapping authorities where you think you might need to go back to Congress and ask for some reworking of the CMO structure? You know, we haven’t had to go to Congress yet, so I will give you an example of that in the IT space. There were some areas that we were questioning internally, so we sat down with Dana Deasy, our [chief information officer], and we worked it out amongst ourselves and relooked at the language in statute, and it fit the intent, so we were fine. We also meet, by the way, with [House Armed Services Committee] and [Senate Armed Services Committee] staff members every other week so we can give them regular battle rhythms and updates, and they ask this question very often. So we are in a constant communication loop with them, making sure that there isn’t anything we’re struggling with. Can you go into that IT example? Yeah. CMO actually has responsibility and authority for “business systems.” So what’s a “business system” versus a “network”? So it’s those kinds of things that we’ve been able to actually partner with the CIO and work out. Secretary Jim Mattis was a major proponent for reform efforts within the department. With him gone, do you have confidence these efforts will continue forward? Yeah, I do. He was a great proponent for reform, and for change, obviously, through what you saw on the National Defense Strategy line of effort number 3. Acting Secretary of Defense Patrick Shanahan in 2017 (then deputy secretary of defense), before many of us got here, started the ball rolling. He said: “Let’s not worry about putting all the structure in place.” We needed to catch that up, though, to make sure that we sustained it. So I’ve been doing one-on-ones with Mr. Shanahan when he was our deputy since as far back as May. And then, the comptroller and CMO have had a very close relationship, so I met with the comptroller, David Norquist (now the acting deputy secretary of defense), very regularly. This has been, for me, a very seamless transition, and it’s business as usual, so it’s been positive. So no major changes to how you’re reporting up? Let’s talk Norquist. He and I used to do, when he was comptroller, about a monthly battle rhythm, but we’d also see him for audit-related meetings as well. Since he’s become [acting deputy secretary], he’s actually taken a very concerted view on reform and has been doing multiple meetings to do deep dives. He loves this stuff, and he gets excited, and he is very attuned to the details, and he wants to go in the weeds. The weedier the better. CMO’s office has a big role in managing the ongoing annual audit for the DoD. How are you staying on top of that? We’re holding biweekly meetings, keeping up on our corrective action systems. We’ve actually created for the audit a common database of corrective action plans in order to track the execution of the corrective actions. So that’s something that’s new that has been put in place. Having that collection in a database is giving us good information to tell us where we have systemic issues, and we’re tying that into reform. Absolutely going to take the same approach for the next go around as well. So we’re looking to continue to be a co-sponsor. It’s been very good from a data standpoint for us.